Back in November, I presented my pretty frank thoughts regarding the upcoming, brand-new “professional” football league, the Alliance of American Football, which made its grand debut this past weekend. (Quick recap: I was NOT all that excited about it). Some reports even stated that close to three million viewers were tuned in at one point on Saturday night. A lot of things factor into those numbers, and it’s tough to pin down an exact total, but regardless: color me completely shocked. ESPN’s Ben Cafardo responded by saying that the Houston/OKC game did peak with a rating of 3.2 from 11 p.m. to 11:15 p.m. that night, but the fact that they were lagging behind the AAF at any point on a Saturday night is still noteworthy. Now, much of the initial interest could be due to simple curiosity. It’s new. It’s (slightly) different. And it was another way to get a football fix after the high from last week’s Super Bowl wore off. But, if we’re being honest, the XFL was the talk of the town when it first debuted in 2001 before flaming out in a flash, lasting just ONE season. All four road teams lost. One team was shut out entirely, and another two could only muster up six points. Or, maybe I’m just speculating too much and trying to save face for what I said in November. Only time will tell, but even after all the positive reviews I’ve seen over the past couple of days, I’m still not ready to dive in. Also, let’s not forget that the aforementioned XFL will be making its comeback in 2020. 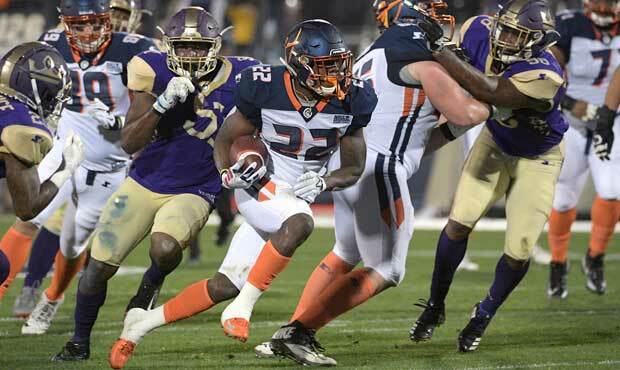 The AAF has only this season to solidify its place in the hearts of fans throughout America until they will be squaring off against entertainment legend Vince McMahon, who will be determined that the league does not see the same fate it saw during the first go-round. Either way, it will be just one more obstacle this league will need to overcome not so far down the line. (The Game is Much Quicker): As much as I love the NFL, some games, especially those in prime time, can have you in for quite the long haul. With all the commercials and replays, it can actually drag at points. Only Major League Baseball comes with comparable length times, and both leagues have been trying to do everything in their power to speed things up over the past few years. I don’t have the exact numbers for each AAF game this weekend, but most of the games wrapped up in just under 2.5 hours. Much of this has to do with less advertisements, but eliminating kickoffs, extra points, and shortening the play clock to 35 seconds (from 40) were also big factors as well. You won’t be seeing any of this in the AAF. AAF has audio of Mike Martz saying he’s thinking about a QB change. So, look, while the AAF had a great kick-off weekend and has I guess some potential, it’s still got quite a long way to go. While I’m not ready to go out and buy my Orlando Appolos jersey yet, I will be keeping a tepid interest in it for now, just in case. What do you guys think? Have any of you watched it? We’d love to hear your thoughts on the AAF in the comments or on Facebook. This entry was posted in News, NFL and tagged AAF, American Alliance of Football, American Alliance of Football Kickoff, NFL, XFL. Bookmark the permalink. 3 Responses to So Apparently the Alliance of American Football is Getting Good Reviews?